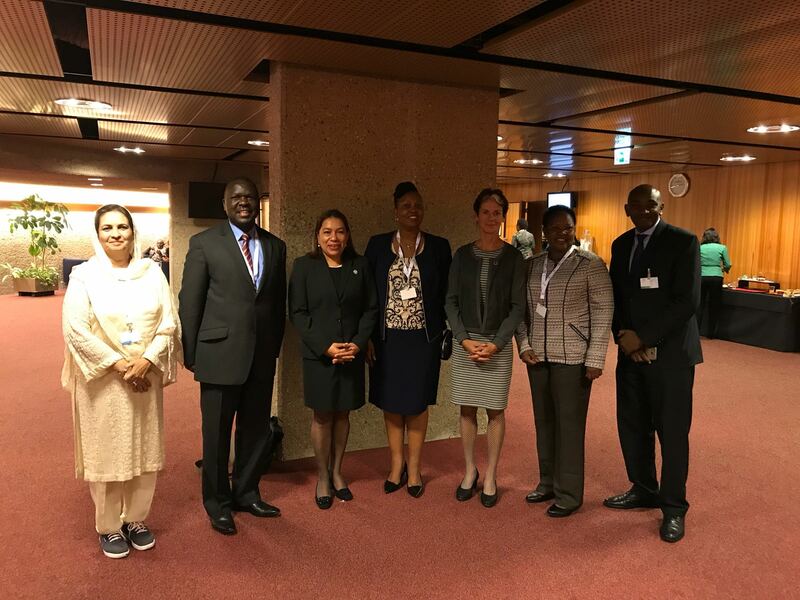 On 16th October, the SUN Movement Secretariat, in partnership with the Interparliamentary Union (IPU), FAO, WHO and the Partnership for Maternal, Newborn and Child Health co-organized a side event at the 139th IPU Assembly in Geneva, titled: Legislating on food and nutrition: lessons learned, challenges and opportunities for parliamentary action. The event provided an opportunity for parliamentarians to showcase successful examples of how nutrition legislation, policies and budget advocacy helped advancing nutrition in diverse national contexts and foster sharing and learning amongst members of parliament, and to encourage leadership and call for commitments of parliamentarians to leverage the momentum behind the UN Decade of Action on Nutrition 2016-2025 and achieving SDG2. 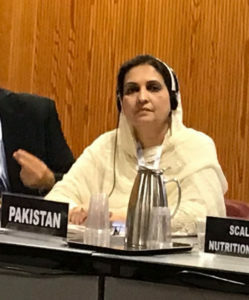 The SUN Movement Coordinator, Gerda Verburg, moderated the interactive discussion highlighting the role parliamentarians can play in advancing good nutrition at country level. 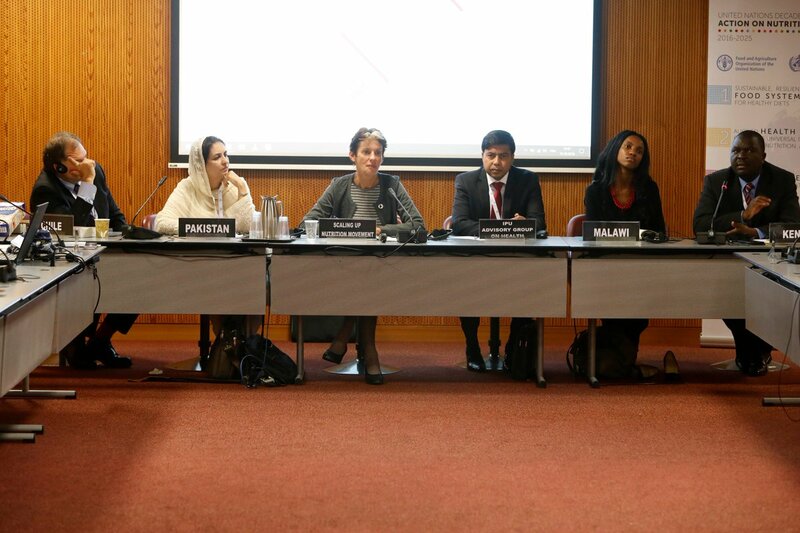 Best practice was discussed regarding labeling and inappropriate marketing of unhealthy foods to children in Chile; influencing political party manifestos and the role of regional parliaments in Pakistan; legislation on breastmilk substitutes and the right to food in the constitution in Kenya and youth engagement with parliamentarians on nutrition issues in Malawi. 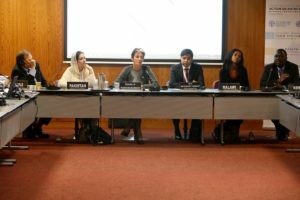 Speakers included parliamentarians from Bangladesh, Chile, Pakistan and Kenya, a PMNCH Adolescent and Youth Constituency member from Malawi, and representatives from WHO and FAO. 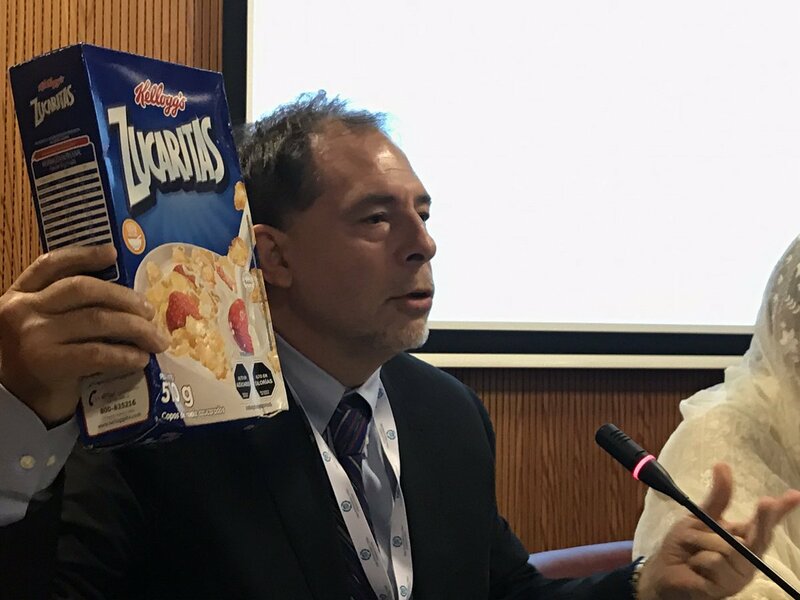 Senator Guido Girardi, Chile: It’s not acceptable that diets are a major cause of disease – the consumption of fast food and sugary food created huge problems with overweight, obesity and NCDs in Chile. People have the right to understand what they eat and make healthy choices. 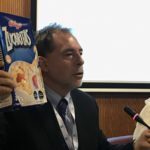 Normal industry nutrition labels can be confusing even for experts – Chile made it mandatory to put a black warning logo on food packages high in sugar, salt, calories and saturated fat, while also prohibiting the sale of junk food in schools and forbidding advertisement of unhealthy food to young audiences. Several other countries are now learning from Chile to do the same thing and industry is already changing their products to be healthier.